Lora Iannotti has expertise in maternal and young child nutrition and nutrient deficiencies (zinc, iron, vitamin A, B12, choline, and fatty acids) related to poverty and infectious diseases. She applies epidemiological methods to investigate interventions aimed at reducing stunted growth and development. Iannotti leads projects in Haiti, Ecuador, and East Africa where she collaborates with local partners to test innovative, transdisciplinary approaches using animal source foods and small livestock and fisheries development. She is founder and director of the E3 Nutrition Lab, working to identify economically affordable, environmentally sustainable, and evolutionarily appropriate nutrition solutions globally. 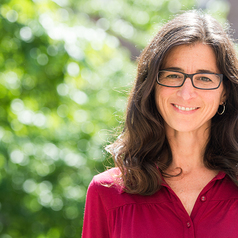 Iannotti serves as Associate Dean for Public Health, leading the MPH program at the Brown School. Iannotti received her doctorate from the Johns Hopkins University Bloomberg School of Public Health, and a Master of Arts degree in Foreign Affairs from the University of Virginia. Prior to pursuing her PhD, she worked for over ten years with UN agencies and non-governmental organizations on nutrition and food security programming and policy. She serves on public health advisory and journal editorial boards and consults with WHO, International Livestock Research Institute (ILRI), among other international organizations.